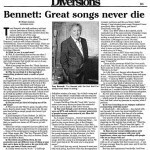 This article by Robert Loerzel originally appeared in Pioneer Press on August 26, 2004. 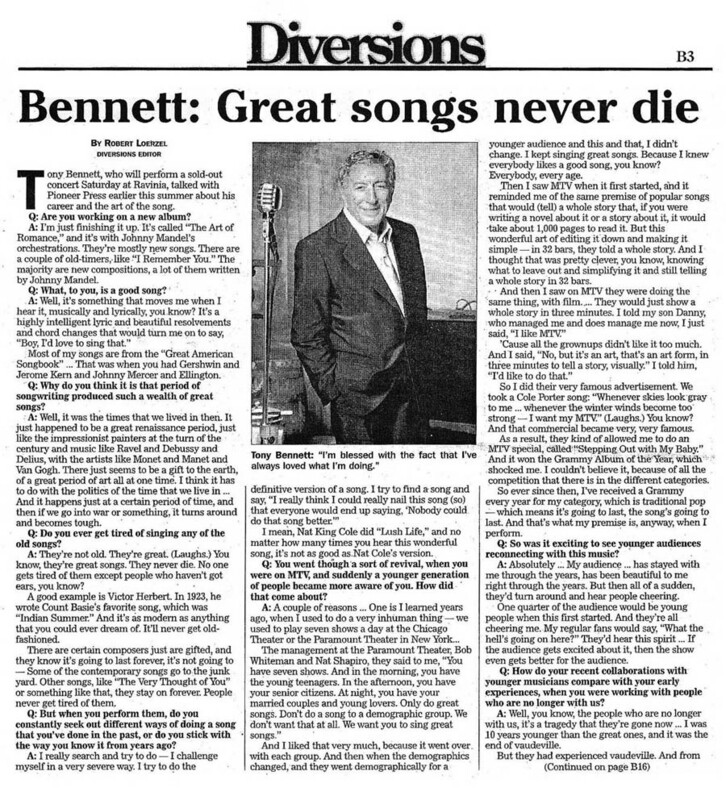 Tony Bennett, who will perform a sold-out concert Saturday at Ravinia, talked with Pioneer Press earlier this summer about his career and the art of the song. Q: Are you working on a new album? A: I’m just finishing it up. It’s called “The Art of Romance,” and it’s with Johnny Mandel’s orchestrations. They’re mostly new songs. There are a couple of old-timers, like “I Remember You.” The majority are new compositions, a lot of them written by Johnny Mandel. Q: What, to you, is a good song? Most of my songs are from the “Great American Songbook.” … That was when you had Gershwin and Jerome Kern and Johnny Mercer and Ellington. Q: Why do you think it is that period of songwriting produced such a wealth of great songs? A: Well, it was the times that we lived in then. It just happened to be a great renaissance period, just like the impressionist painters at the turn of the century and music like Ravel and Debussy and Delius, with the artists like Monet and Manet and van Gogh. There just seems to be a gift to the earth, of a great period of art all at one time. I think it has to do with the politics of the time that we live in. … And it happens just at a certain period of time, and then if we go into war or something, it turns around and becomes tough. Q: Do you ever get tired of singing any of the old songs? A: They’re not old. They’re great. (Laughs.) You know, they’re great songs. They never die. No one gets tired of them except people who haven’t got ears, you know? A good example is Victor Herbert. In 1923, he wrote Count Basie’s favorite song, which was “Indian Summer.” And it’s as modern as anything that you could ever dream of. It’ll never get old-fashioned. There are certain composers just are gifted, and they know it’s going to last forever, it’s not going to — Some of the contemporary songs go to the junkyard. Other songs, like “The Very Thought of You” or something like that, they stay on forever. People never get tired of them. Q: But when you perform them, do you constantly seek out different ways of doing a song that you’ve done in the past, or do you stick with the way you know it from years ago? I mean, Nat King Cole did “Lush Life,” and no matter how many times you hear this wonderful song, it’s not as good as Nat Cole’s version. Q: You went through a sort of revival, when you were on MTV, and suddenly a younger generation of people became more aware of you. How did that come about? And I liked that very much, because it went over with each group. And then when the demographics changed, and they went demographically for a younger audience and this, and that, I didn’t change. I kept singing great songs. Because I knew everybody likes a good song, you know? Everybody, every age. Then I saw MTV when it first started, and it reminded me of the same premise of popular songs that would (tell) a whole story that, if you were writing a novel about it or a story about it, it would take about 1,000 pages to read it. But this wonderful art of editing if down and making it simple — in 32 bars, they told a whole story. And I thought that was pretty clever, you know, knowing what to leave out and simplifying it — and still telling a whole story in 32 bars. So I did their very famous advertisement. We took a Cole Porter song: “Whenever skies look gray, to me … whenever the winter winds become too strong — I want my MTV.” (Laughs.) You know? And that commercial became very, very famous. As a result, they kind, of allowed me to do an MTV special, called “Stepping Out With My Baby.” And it won the Grammy Album of the Year, which shocked me. I couldn’t believe it, because of all the competition that there is in the different categories. So ever since then, I’ve received a Grammy every year for my category, which is traditional pop — which means it’s going to last, the song’s going to last. And that’s what my premise is, anyway, when I perform. Q: So was it exciting to see younger audiences reconnecting with this music? A: Absolutely. … My audience … has stayed with me through the years, has been beautiful to me right through the years. But then all of a sudden, they’d turn around and hear people cheering. One quarter of the audience would be young people when this first started. And they’re all cheering me. My regular fans would say, “What the hell’s going on here?” They’d hear this spirit. … If the audience gets excited about it, then the show even gets better for the audience. Q: How do your recent collaborations with younger musicians compare with your early experiences, when you were working with people who are no longer with us? A: Well, you know, the people who are no longer with us, it’s a tragedy that they’re gone now. … I was 10 years younger than the great ones, and it was the end of vaudeville. But they had experienced vaudeville. And from Charlie Chaplin to Jack Benny to George Burns to Nat King Cole to Lena Horne to Sammy Davis Jr., they all had that vaudeville training. Laurel and Hardy, you know? Finally after 10 years, you’re a consummate performer. But, it takes a lot of dues. Unfortunately, the young people today have to learn that in schools and colleges. 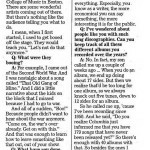 … They could learn at Berklee College of Music in Boston. There are some wonderful artists corning out of there. But there’s nothing like the audience telling you what to do. Q: What were they booing? A: For example, I came out of the Second World War. And I was nostalgic about a song called “That Old Gang of Mine.” And I did a little narrative about the kids on the block that I missed because I had to go to war. And all of a sudden, “Boo!” Because people didn’t want to hear about the war anymore. “Come on, the war’s over already. Get on with this.” And that was enough to learn how to leave something like that out, out of your show. Q: What have you done over the years with your voice, both in terms of how you sing and any vocal exercises? A: Studs Terkel called it “The Good War,” the Second World War. And sure enough, the country backed us up, because under the G.I. Bill of Rights, when we came out of the war, they gave us the American Theater Wing, and I decided I’d like to go into the business. And I studied with the best teachers in New York City, just fantastic, you know? One of my teachers for theater was Stanislavsky’s secretary. And then we had a coach of popular singing on 52nd Street … a wonderful teacher. And then I had a bel canto teacher (who) taught me how to keep my voice by doing proper scales called canto scales, and not what you’d usually think of, with someone kind of belting it out. You could do it privately and very moderately, but you see where you’re at every day, and then after a while, your voice wakes up by doing scales properly. And that’s allowed me to survive. My voice — A lot of reviewers have said, I’m singing better than ever. And I’m 77. Q: Do you feel like your painting influences your music and vice versa, or are they two separate pursuits? A: Well, they’re separate, but in a sense all of the crafts in life are pretty much the same. It’s line, form, color, balance, learning what to leave out, simplifying it. They’re the rudiments of cooking or learning how to play tennis or singing. Those elements are still there in everything. Especially, you know as a writer, the more economical you can say something, the more interesting it is for the public. Q: I’ve wondered about people like you with such long discographies. Can you keep track of all these different album you recorded over the years? A: No. In fact, my son called me up a couple of weeks ago. … When you do an album, we end up doing about 17 sides. But then we realize that’d be too long for one album, so we always knock out five tunes, down to 12 sides for an album. So he called me up, ’cause I’ve been recording since 1950. And he said, “Do you realize Columbia just informed me that you have 179 songs that have never been released yet?” So there’s enough with 40 albums with that. So besides the ones I have out now, there’s that much stuff of material that’s finely recorded by the top musicians and great engineers and all that. Q: Is that going to see the light of day anytime soon? A: Oh, yeah. It’ll all be out at one time or another. Q: You were once quoted saying one lifetime isn’t enough to accomplish all of the things you’d like to do. A: That’s true. You’re never finished. I have so much to do, and I have so much to learn yet. I know I’m never going to finish it, but I’m going for it. It’s just the way it is. You never really arrive. It’s the journey, not the ending of it.